This is it, the European Council Conclusions - Britain's final humiliation. Over the next few days, I'll be taking it apart, but here is a taster. The crucial element is that this deal is styled as a "Decision of the heads of state or government, meeting within the European Council". From this, one needs to note that this is not a European Council decision made within the framework of the EU Treaties. It is an intergovernmental agreement between the heads of state or government of the 28 countries which constitute the European Union. 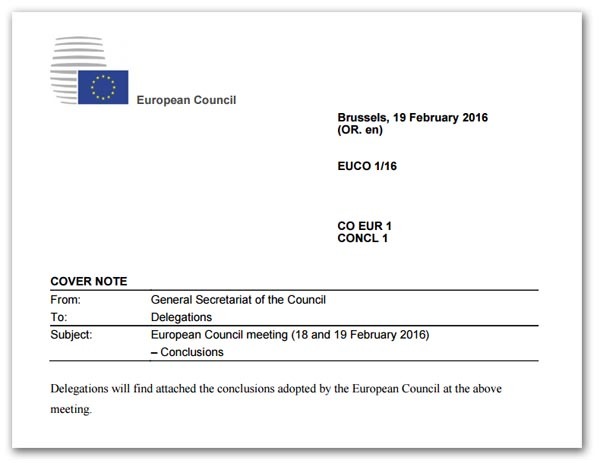 They were meeting within the European Council but were not acting as the European Council. It is recognised that the United Kingdom, in the light of the specific situation it has under the Treaties, is not committed to further political integration into the European Union. The substance of this will be incorporated into the Treaties at the time of their next revision in accordance with the relevant provisions of the Treaties and the respective constitutional requirements of the Member States, so as to make it clear that the references to ever closer union do not apply to the United Kingdom. This does not take much analysis or interpretation. We see in the future tense, the substance – i.e., the acknowledgement that the UK "is not committed to further political integration into the European Union" – is dependent on it being "incorporated into the Treaties at the time of their next revision". In other words, the heads of state or government are making a promise which they are not in a position to make, and have no means of enforcing. In their role as heads of state or government, they cannot commit the European Union to triggering the Article 48 procedure, which requires action by the European Council and the European Parliament, and then agreement of the individual member states at some time in the unspecified future. At that point, the heads of state or government may or may not be the same people who currently made the promise. Not least, there are German and French general elections, and the chancellor and president might have changed. Predecessors cannot bind their successors. A party may invoke the impossibility of performing a treaty as a ground for terminating or withdrawing from it if the impossibility results from the permanent disappearance or destruction of an object indispensable for the execution of the treaty. If Mr Cameron wants to purport that this settlement is a treaty, then there is an "object indispensable for the execution of the treaty". That is these "Treaties at the time of their next revision". The heads of state or government are not is a position to guarantee these "Treaties". The settlement cannot be legally valid. Then, of course, there is the second obstacle. The settlement, as an agreement by heads of government, etc., acting as an intergovernmental body, are outside the framework of the EU treaties. But amendments to the EU treaty require actions by the European Council, legally an entirely separate body, and the European Parliament. Here, the dictum res inter alios acta vel iudicata, aliis nec nocet nec prodocet applies (two or more people cannot agree amongst each other to establish an obligation for a third party who was not involved in the agreement). This is translated into treaty law by Article 34 of the Vienna Convention, which states that "a treaty does not create either obligations or rights for a third State without its consent". Put simply, this part of the settlement cannot be binding. Its execution depends on something outside the control of the parties making the promise, rendering it impossible to guarantee delivery. And then no parties to a treaty can bind another to its provisions, without their consent (which the EU is not in a position to give). On any level of scrutiny, therefore, this single leg of the settlement doesn't stand up. It is not legally binding. And we've only just started with Cameron, a man to whom lying and deception come easily.